When guests come to stay at my house, I want them to have a nice relaxing room to stay in. I want it to be nicely decorated, with almost a hotel feel. And I want all this without spending a lot. Since we just now got a set of master bedroom furniture, nice guest room furniture is pretty far down on the wish list. 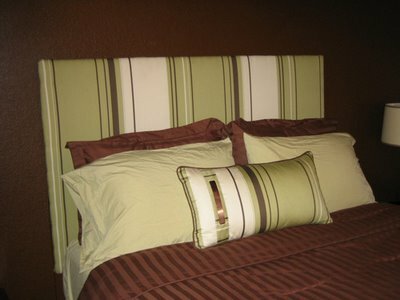 Here are a few headboard ideas you can use to pull together a nice room on a budget. Pick something that coordinates with an existing dresser or night stand so that it looks like you put a lot of thought into the room without a lot of $. 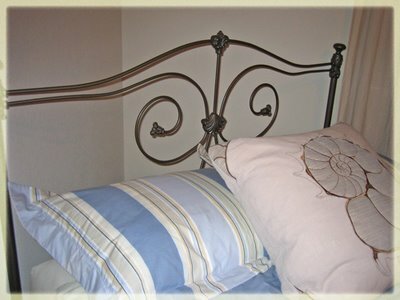 Wall Decal Headboard - check out spots like etsy.com for inexpensive versions. For tips on how to apply one successfully, click here. Iron Bed Makeover - an inexpensive iron or metal bed can be easily painted to bring it up to date. Check out craigslist for awesome 80's white metal ones. You can paint over the brass hardware for a clean, uniformed look. Also, metal day beds are perfect for home office/ guest room combos. Add a ton of pillows for a "couch" look, then remove them when guests are coming. 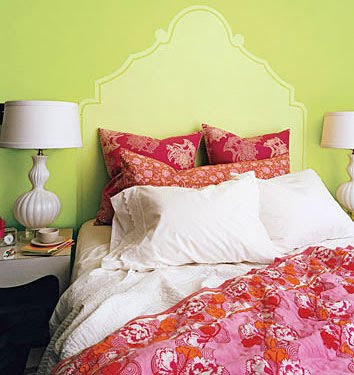 Painted Wall Headboard - a good choice of your walls aren't too textured. Get a sample/tester size of the paint for this project, its all you need. 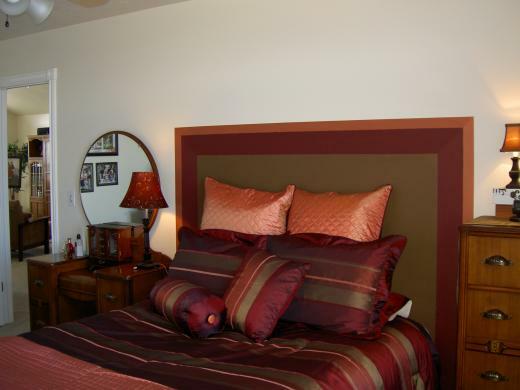 So pick a weekend and give your guest room a simple, inexpensive makeover!